Close Outstanding Orders when position is closed - when one of the orders that closes the position is triggered or in case of the manual closing of a position, all other pending orders will be canceled regardless of whether they are related to each other via a protective strategy or the OCO option. One-Click Mode - if this mode is disabled, the system will prompt you for a confirmation to perform a transaction. When this mode is enabled, transactions will be executed with one click and will not require confirmation (therefore, this mode should be used with care). To enable this mode, set checkbox of this option. Trading in the Simple Order Placing Mode. By default, this option is enabled. 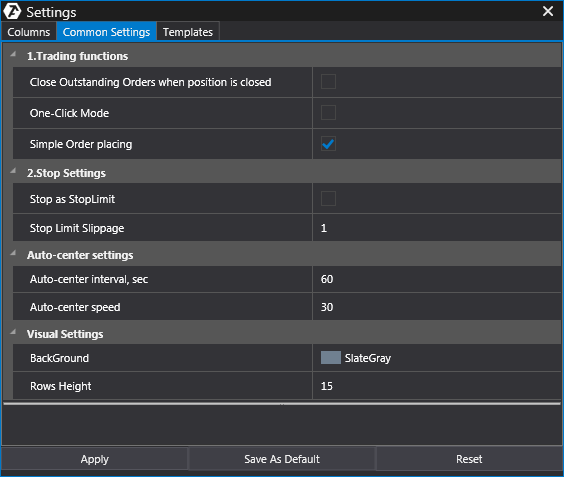 All actions to send orders are executed using left-clicks with your mouse. The type of the issued order is displayed automatically depending on where (namely, above or below the market price) as well as in which column (Bid or Ask) the mouse clicks. If the option of auto-identification of the type of the order is disabled, both left-clicks and right-clicks can be used to issue orders. The left-click places a limit order, and the right-click places a stop order. Stop as StopLimit - issue stop-limit orders (limit orders) when the slippage can be controlled. In case of stop-limit, the exchange mechanism for order consolidation will give the best price; however, the possible slippage will be limited in case of high volatility and non-liquid instruments. Yet, there is no guarantee of filling the order in this case. Stop limits are commonly used to enter the position so as to control the entry price. The difference between a stop-limit and a stop is that two prices (the Trigger price and the Limit price) are indicated when the stop-limit is placed. And when the price reaches the Trigger price value, the stop-limit is converted into a limit order with the filling price at the level of the Limit price. Stop Limit Slippage - this is the value of the different between the Trigger price and the Limit price for stop-limit orders. There are situations when an order can fail to trigger, which usually happens with strong pulse movements. This function helps solve the above problem: you specify the maximum value by which your order can be "dragged" (i.e., the order will be filled in any case within the specified parameter range). Auto-center interval, sec - this module uses the depleted DOM mode, i.e. the spread is a floating one. Using this function, you can set the desired option of the interval in seconds, after which the spread will be automatically centered. * If you do not require auto-centering, an interval of up to 10 hours can be specified in seconds. Auto-center speed - this option indicates the speed of the auto-centering is indicated in seconds. BackGround - the color of the DOM background. Rows Height - the height of DOM rows.